Hayley explained that she'd been training hard and wanted to get some shots showing her best form in an 'action' style before her competition!? It was only when we met up on a Friday morning at the amazing Lee Valley Athletics Centre near Enfield that Hayley told me what she had challenged herself to compete in the UKDFBA (the United Kingdom Drug Free Bodybuilding Association) Open UK Championships on Saturday 27th September 2014 at Leamington Spa (the day after our shoot!). Hayley worked under the expert guidance of Tim Sharp Personal Trainer since 1988. Owner of @Sharpbodies PT Studio. 5 Times Mr Britain finalist. TV Presenter to achieve the body she needed to be competitive. 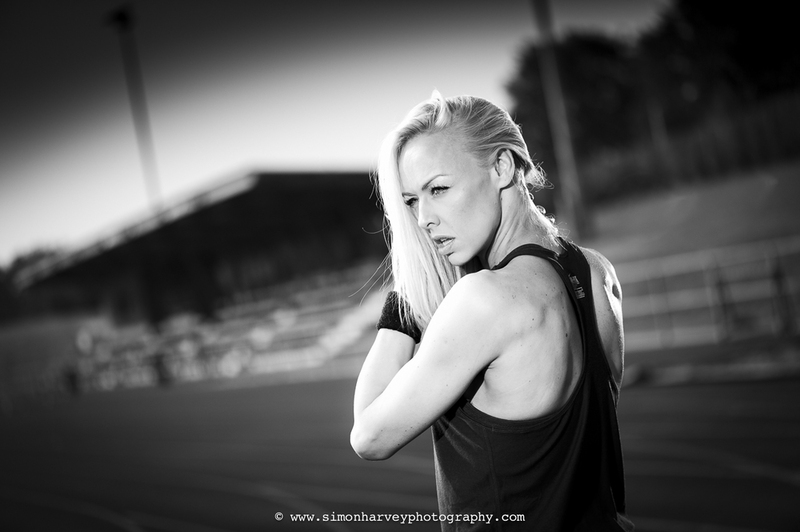 To help accentuate Hayley's Form and tone, I knew I would need to do something a little different to make her 'pop' if we were shooting on a sunny day, at an Athletics track!? Enter recently purchased new toys... (Phottix Odin flash trigger and receivers for my Nikon SB800 and SB910 Flashes) from the lovely people at The Flash Centre, London, so thought this could be a great opportunity to try some High Speed Sync Photography. This would allow me to not only freeze Hayley in action - showing her muscle tone and energy to its max, but also allow a fast enough shutter speed to darken down the background. Like most photographers, we don't like reading instructions, but luckily the Phottix Odin system is a TTL system, and really is very simple to use. It wasn't long before we were getting some great results! so If you fancy giving it a go, get down to the flash centre, grab yourself an extremely fit and willing model and off you go! Have fun!